Preacher Shaw, circa 1926. Image courtesy of Bryan Shaw. Preacher Shaw was a son of Ray City, Georgia. He was a popular baseball player, sometimes politician, and salesman of Berrien County. His given name was Fondren Willie Mitchell Shaw, but at a young age he acquired the nickname “Preacher,” a moniker that stuck for life. As a boy, Preacher Shaw attended Pine Grove School and the Kings Chapel School, located just across the county line, in Lowndes County. His parents, Jesse Shelby “Dock” Shaw and Susie Bullard, had attended the same school in their youth. It was at the Kings Chapel school that Preacher Shaw met his life-long companion, Susie Ray, daughter of Charles M. Ray and Maggie Hutto Ray. She had finished her educational training by attending Georgia State Womans College [now Valdosta State University], and had been teaching at Pleasant Vale and Indian Camp schools. She had just started teaching at Kings Chapel when she met young Preacher Shaw. It is not clear if he was finishing his formal education of if he was attending a function there and made her acquaintance. The only automobile that the couple had to court in was the rumble-seat coupe that belonged to Susie. But it was adequate and they were mar- ried on November 13, 1927 in the home of Susie’s parents by Elder Aaron Knight. The couple set up house for a brief time with Susie’s parents, where their first child, Latrelle was born July 14,1928. They shortly thereafter moved into the Martha Carter place just off of the Old Valdosta Highway near Barker Road. Here their second child Lawanna was born March 26, 1930. During this time, Preacher was farming the property of Susie’s parents. The family then moved into a small home on Indian Camp Road about a mile west of the Ray homeplace. It had been the old White Pond Church, which had been moved to the Ray property by Preacher and Susie’s brothers, Henry and Buck. By November the following year 1931, Preacher and Susie had moved over to the “Dock” Shaw place, helping on that farm. They lived in the log house that Preacher had been born in 25 years earlier. Their third child, a son Otis was born on November 16, 1931. Early the following year in 1932, Preacher suddenly suffered an attack of appendicitis, and was rushed to the Little Griffin Hospital in Valdosta. His recovery was slow, and Susie stayed at the home of Preacher’s sister, Cora Shaw Griffin. Susie visited Preacher daily while walking to the hospital and back carrying baby Otis. 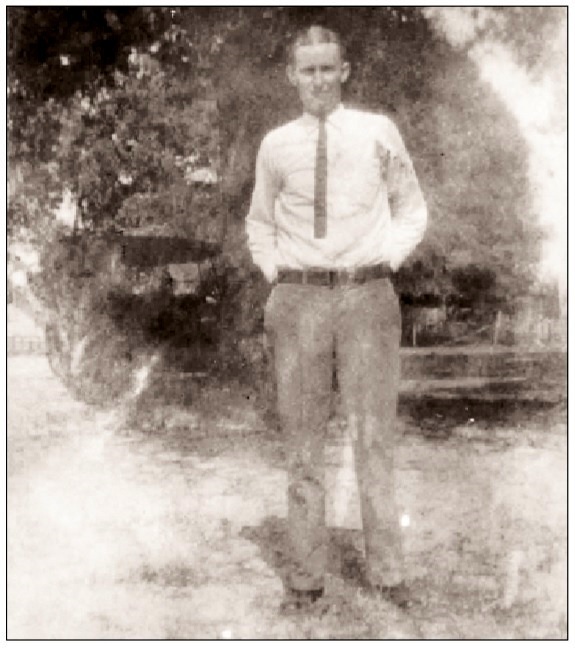 Preacher worked the Ray property until about 1937, when he went down to Jacksonville, Florida to work for his brother-in-law, Lewis Ennis, Mary Idell’s husband. Lewis owned and operated a service station and oil company in Avondale, Florida. Preacher would drive back and forth from Jacksonville to Ray City about once a month, while Susie worked the family farm. The children were attending the New Lois School about this time, walking the four mile distance each way, daily. One of their fondest childhood moments was when Preacher brought home a used girl’s bicycle from Jacksonville. With the birth of their fourth and last child, Gerald on April 5, 1938, Preacher found employment a little closer to home, working on a construction crew, building roads near Thomasville. However this opportunity turned into tragedy, when one of the construction tractors turned over on top of him. He was hospitalized in critical condition for sometime before finally recovering. He carried scars from that accident the rest of his life. All during the months and years that Preacher was working out of town, Susie was home, raising the children and working the farm. She was also an accomplished seamstress, sewing all of the children’s clothes. She was often sought after for seamstress work by many of her neighbors and her work was well known throughout the county. When Preacher recovered from the accident, he returned to work the farm, and the family moved in and lived with Susie’s widowed mother. About 1940 Mrs. Ray deeded the Ray homeplace and 100 acres of the farm in the 134th land lot to Susie. Maggie Ray died August 2, 1942. About 1945, Preacher went to work in Nashville for Jake Rutherford in the fertilizer business. This began a long venture in the feed, seed, and fertilizer business that lasted over two decades. He worked at the Leah Stallings Feed and Seed, Perkins Warehouse, and John David Luke at the Nashville Mills. He was a “drummer”, a natural-born salesman, selling seed and fertilizer, then traveling through out Berrien and the surrounding counties, buying back the farmers’ crops. Then he would sell them seed for the next crop year. Dorothy Boyette, of Ray City, GA. 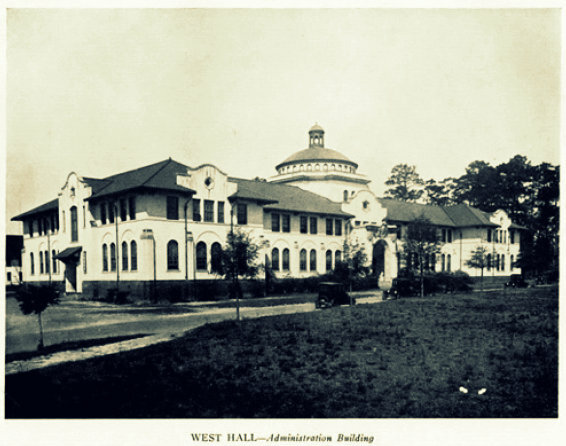 Attended Georgia State Womans College in 1944. Frances Clements, of Ray City, GA. A 1944 sophomore at Georgia State Womans College, Valdosta, GA.
Geraldine Fletcher Giddens, 1943 freshman class photo, Georgia State Womens College. She was a resident of Ray City, GA while attending G.S.W.C. during the 1940s. 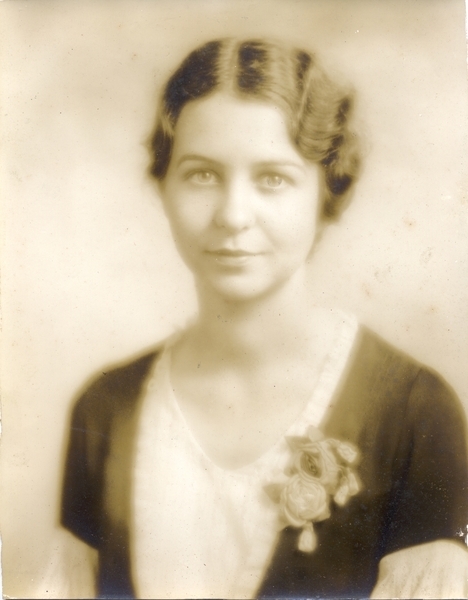 Luelle Giddens, 1934 student of Georgia State Womans College. Thera Hambrick, of Ray City, GA, 1935 freshman at Georgia State Womans College. Mollie Idelle Lee was born Feb 28, 1919 near Ray City, GA in that part of Berrien County that was cut into Lanier County in 1920. She was the youngest child of Mollie Clements and William David Lee. 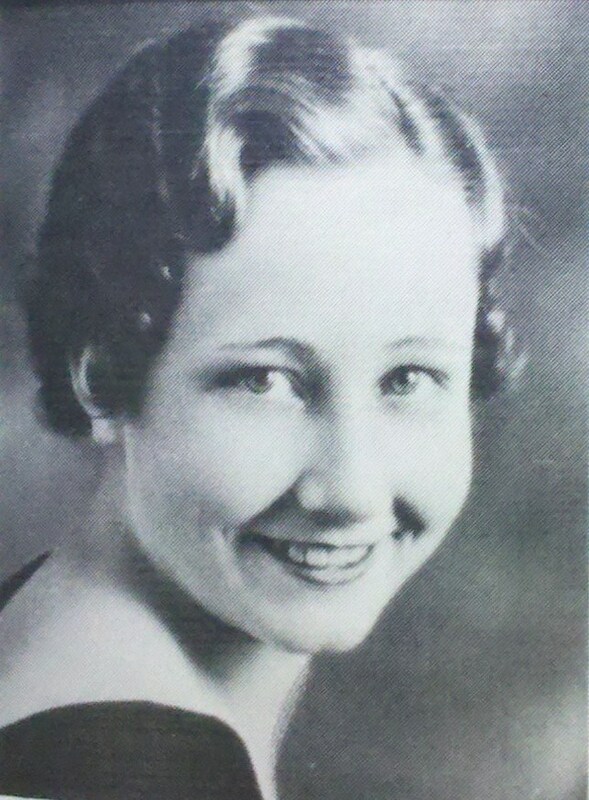 Mollie Idelle Lee, 1937. 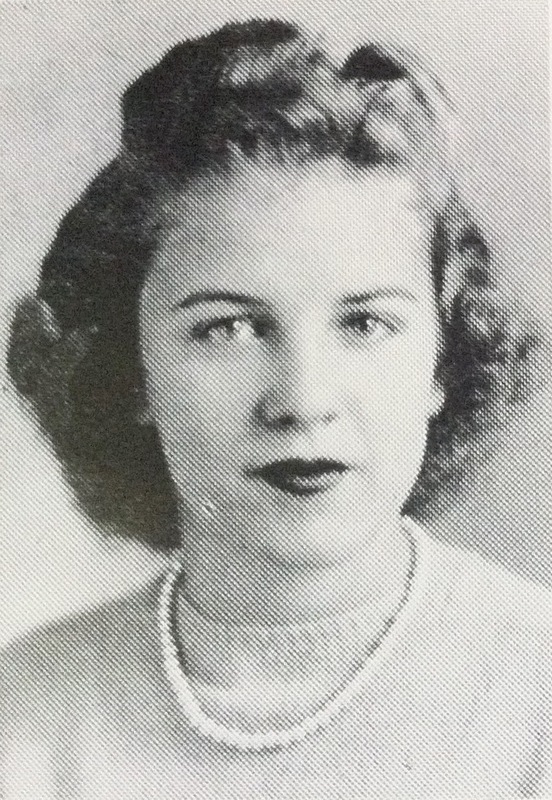 Freshman at Georgia State Womans College, Valdosta, GA.
Judy Moore attended G.S.W.C. while a resident of Ray City, GA in the 1950s. Judy Moore, of Ray City, GA, 1950 sophomore at Georgia State Womans College. Doris E. Swindle was born and raised in Ray City, GA. She was a daughter of Sarah Ellen “Stell” Daniel and James Henry Swindle. 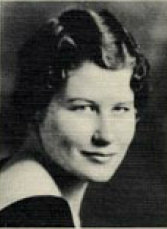 Her father was a farmer and merchant of Ray City, and served in the Georgia House of Representatives in the 1930s. She died in an automobile accident in 1941. Grace Swindle was the youngest daughter of Sarah Ellen “Stell” Daniel and James Henry Swindle, and sister of Doris Swindle and James Aaron Swindle. Grace Swindle, Freshman, Georgia State Womans College. 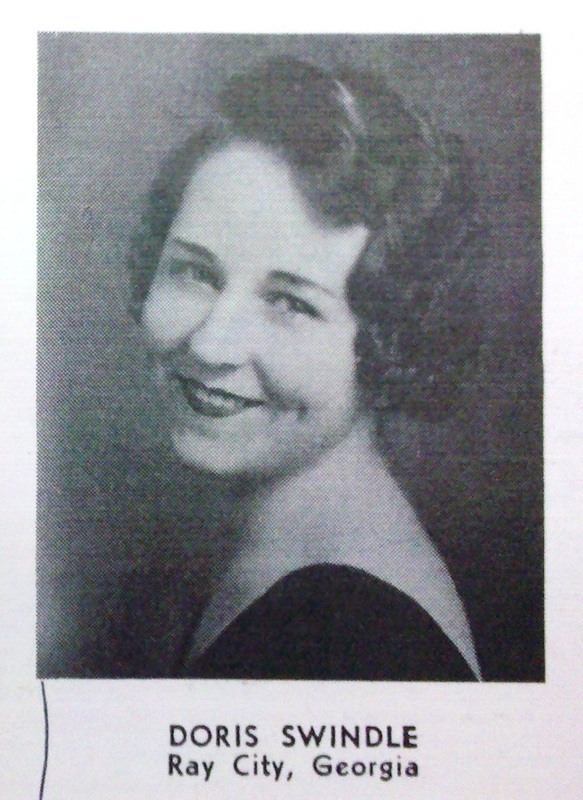 Frances Clements, daughter of Hod P. Clements of Ray City, GA and subject of previous posts ( A Shower for Frances Clements), excelled at technical studies. 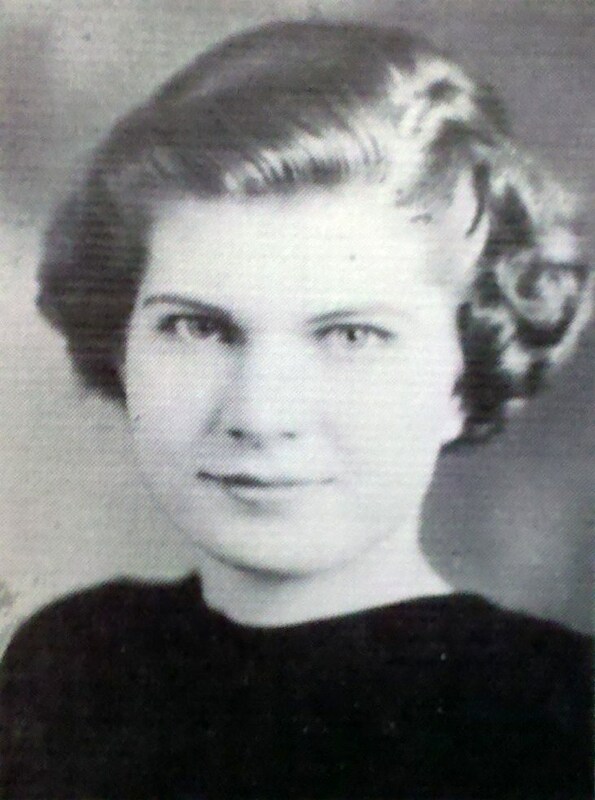 After completing high school at the Ray City School she went on to enroll at Georgia State Womans College, now known as Valdosta State University, entering with the freshman class in 1943. 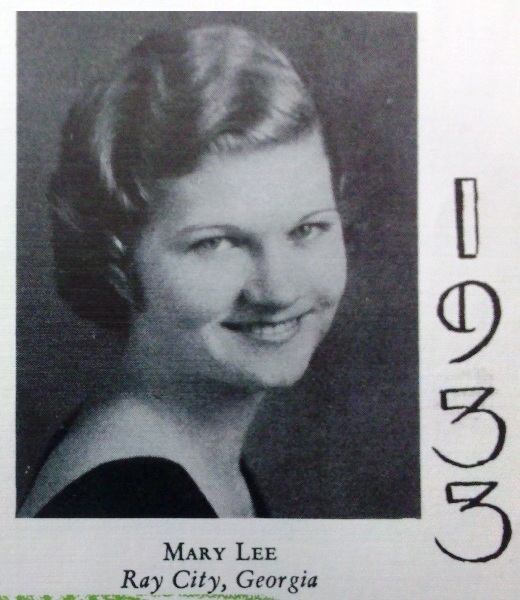 In 1944, her extra-curricular activities included the Math-Science Club. Our rendezvous with frogs, formulas, and figures combines our interest into one club, the Math-Science Club. There are three divisions: Chemistry; Biology, and Mathematics; and the students may become a member of any one of these groups according to their chief interest. These divisions present monthly programs and bring the practical nature of the sciences to the members. This year the club has endeavored to do its bit for the war effort by contributing part of the dues, and proceeds from a dance and the scrap paper drive to the War Bond Scholarship Fund. 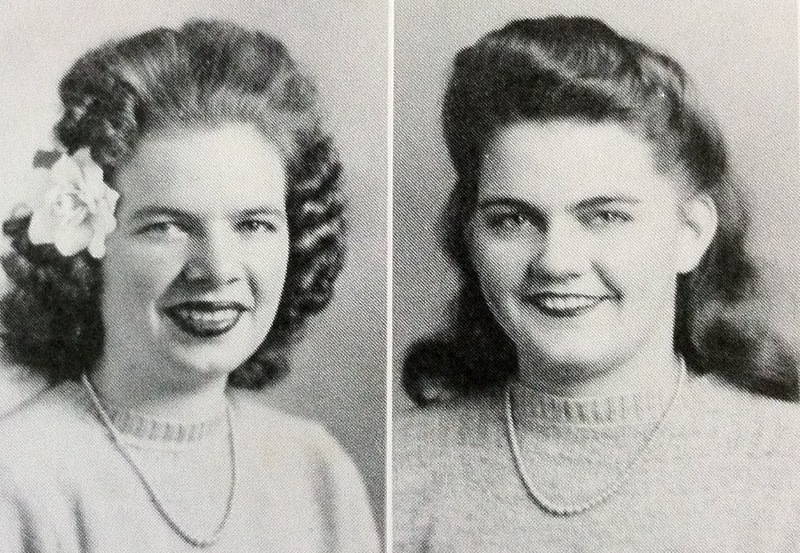 In the 1940s Annie Ruth Clements and Frances Clements, Ray City cousins, both attended Georgia State Womans College, now known as Valdosta State University. The Clements girls were descendants of one of the pioneer families of Ray City,GA and were both granddaughters of John Miles Clements (1859 – 1937). Annie Ruth Clements was born at Ray City, GA about 1924, a daughter of Mary Elizabeth Lee and William A. Clements. Her father was a farmer and butcher at Ray City. 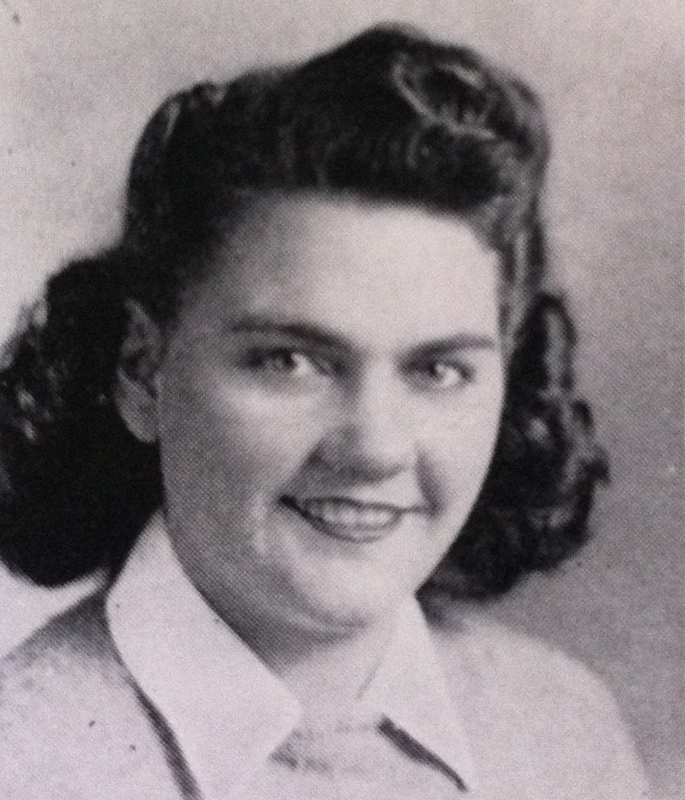 She was a sister of Billie Clements who would later own the Victory Soda Shop in Ray City. The long-time Ray City landmark opened in 1943, during WWII, and during the time Annie Ruth was attending G.S.W.C. Frances Clements was born about 1925, also at Ray City, GA, a daughter of Alma Florence May and Hosea “Hod” P. Clements. Her father was a graduate of Georgia Normal College and Business Institute, and a prominent businessman of Ray City. After college, Frances Clements married Lawrence Carter and the couple made their home in Valdosta. Geraldine Giddens was a resident of Ray City, GA in the 1940s while she attended Georgia State Womens College in Valdosta, GA (now Valdosta State University). 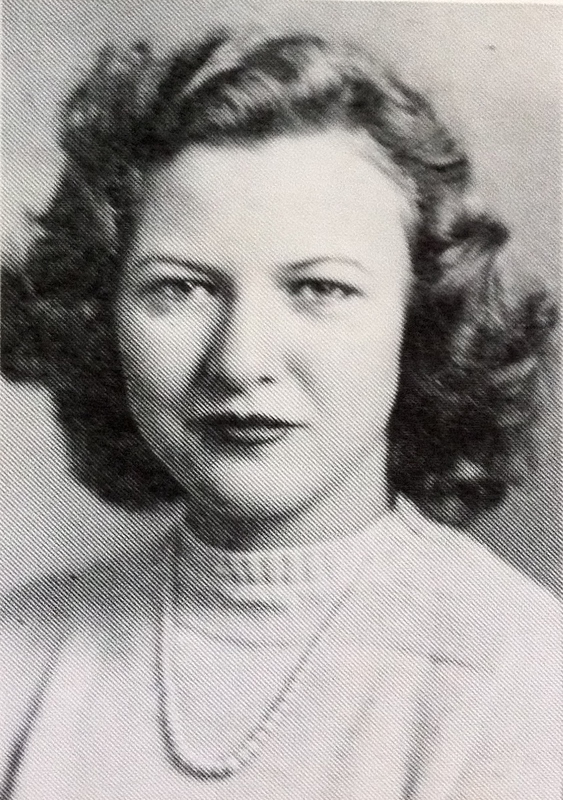 Born Geraldine Hester Fletcher on February 2, 1924, she was a daughter of Eliza Carter and Zachariah Fletcher. She spent her childhood in Dasher, GA just south of Valdosta. Geraldine Fletcher married Norvell “Joe” Giddens, and the young couple made their home at Ray City, GA. He was a son of Emma Ward and Albert Sidney Giddens, of Cook County. 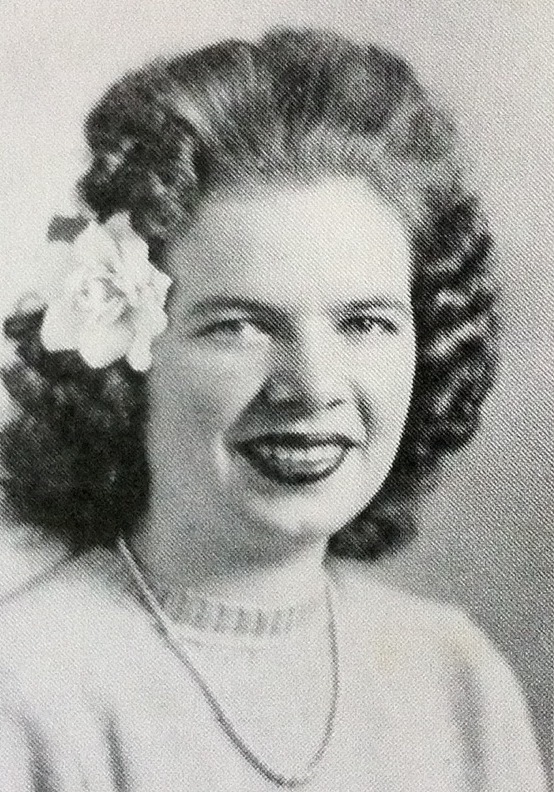 In 1944, Geraldine Giddens was a member of the Sociology Club at G.S.W.C. The Sociology Club, composed of the majors and minors in this field, has carried on a variety of activities during the 1943-44 year. One meeting in each quarter was devoted to the rolling of bandages at the Red Cross room. A dance was sponsored for the benefit of the War Bond Scholarship Fund, and a War Savings Stamp was brought to each meeting by all members. A donation to the Chapel Fund was made from the club treasury. The club became foster parent s to a refugee child in a colony in England by a $50 contribution which provides a bed for the child for a year. An agency membership was taken out in the Georgia COnference on Social Welfare for 1944, and the issues of the bulletin “Georgia Welfare” received from the Conference were donated to the library. Programs during the year were related to various concerns in the field of social work. Outside speakers were brought in whenever possible. “Granny Giddens was born on February 2, 1924. She went home to be with the Lord on April 19, 2011. She grew up in Valdosta, Georgia with a large happy family of 10 siblings. Moved to California in 1955. Lancaster became her home in 1968. Granny had 3 children. Jerry and Joey Giddens that she missed very much and her daughter Shirley Griffiths of Lancaster. 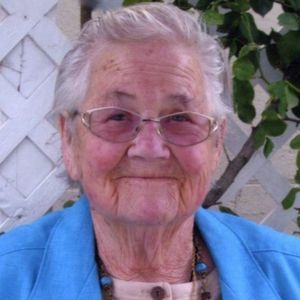 She had several grandchildren and great-grandchildren. Her happiest memories were taking care of them. Work of any kind made Grannys day, she needed to be busy. Over the years she had worked at Howard Johnsons, Mayflower Gardens and Whole Wheatery. Later in life she kept busy having garage sales and making sure Panache Salon was clean and orderly. Her daily visits to the senior center for lunch and their bus trips were a blessing. Her down home strength and life lessons will take us through, this sad time and will help us to continue to grow. Granny was loved and will be missed by all that knew her. Louelle Giddens’ Student Activities at G.S.W.C. 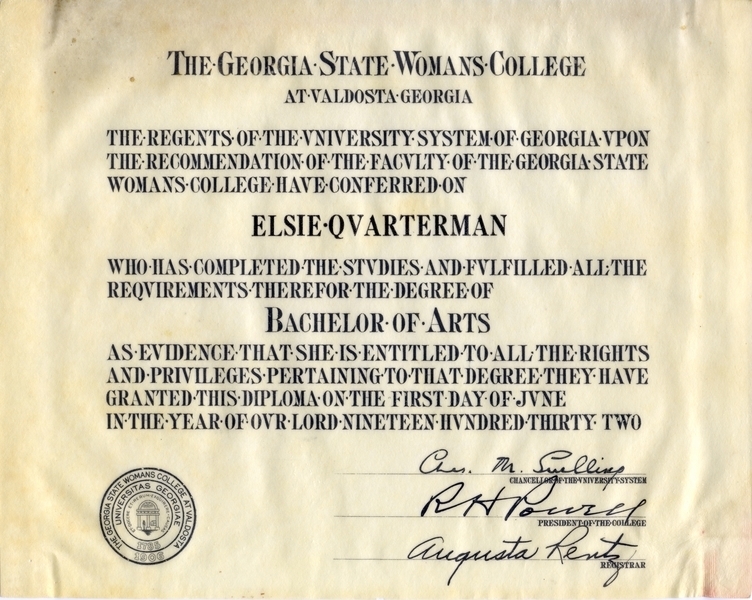 A previous post noted that Luelle Giddens, of Ray City, attended Georgia State Womans College (now known as Valdosta State University) from 1933 to 1935 where she was a member of the Euclidean Club. 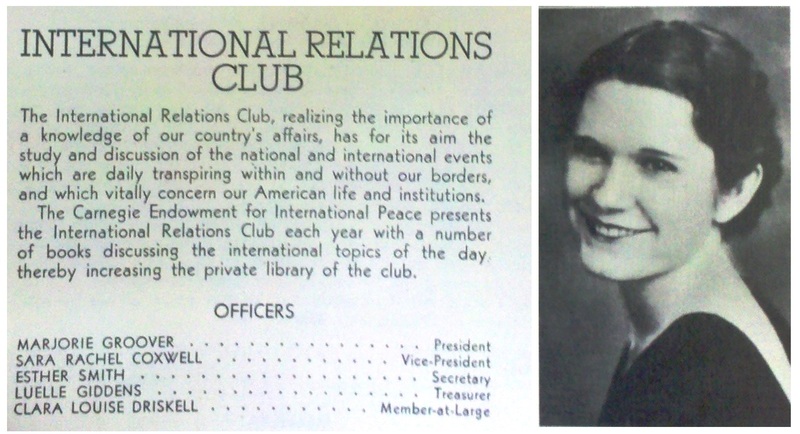 Among her other activities while at G.S.W.C. she was also a member of the Valdosta Club and served as Treasurer of the International Relations Club. The Valdosta Club is an organization composed of the alumnae of the Valdosta High School. It holds monthly meetings of a social nature, including luncheons, tea dances, and specialty features. The purpose of the club is to promote a friendly feeling between the boarding and day students, to emphasize the social life of the college, and to be a means of interpreting the activities of the day students and the town. Doris E. Swindle was born and raised in Ray City, GA. She was the daughter of Sarah Ellen “Stell” Daniel and James Henry Swindle. 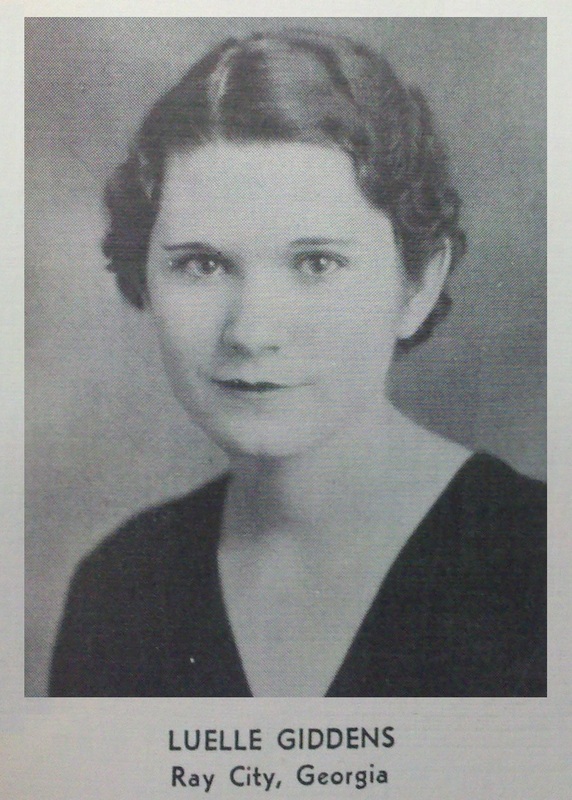 Her father was a farmer and merchant of Ray City, and served in the Georgia House of Representatives in the 1930s. 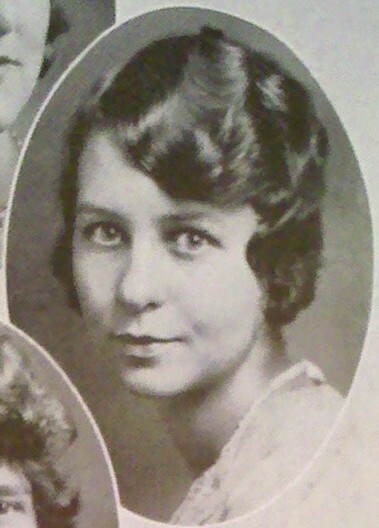 Doris Swindle attended school in Ray City and graduated with the Ray City School Class of 1930. 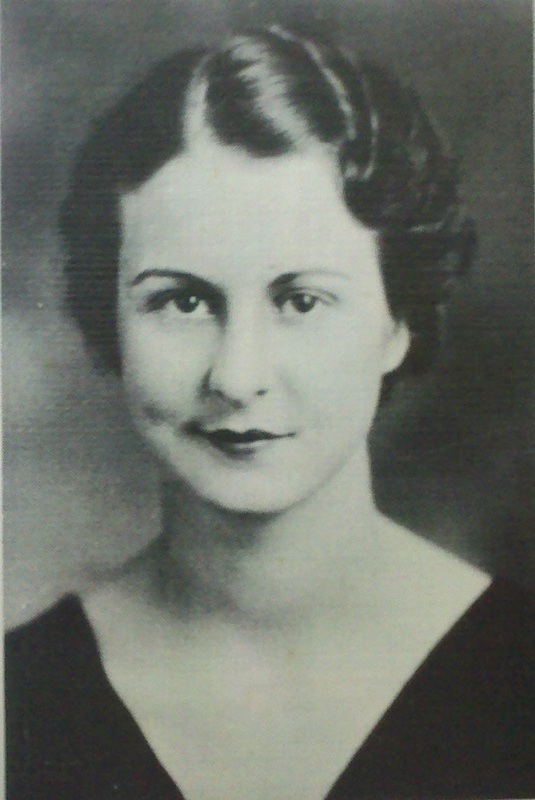 In 1934 and 1935 Doris Swindle attended Georgia State Womans College, now known as Valdosta State University, Valdosta GA.
Mrs. Doris Swindle Smith, 25, of Ray City and Jim I. Wisenbaker, of Lowndes county, were killed and five others were injured when two automobiles crashed Sunday night south of Valdosta. Mrs. Smith was a daughter of J.H. Swindle, a former member of the Georgia Legislature, and Wisenbaker was a member of prominent Lowndes county family. 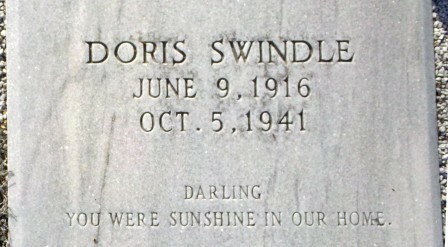 Grave marker of Doris Swindle (1916-1941), Beaver Dam Cemetery, Ray City, Berrien County, GA.